It took a 21-year-old a few minutes to come up with an idea which has made him more than one million dollars in four months. So what's his secret? It started with a blank notepad, an overdraft and a shortage of socks. Now it's a million-dollar business. Last August, as a three-year degree loomed, Alex Tew lay on his bed in his family home in Cricklade, Wiltshire. It was time for his nightly brainstorming session. This time, the problem was his finances. He already had an overdraft, which was sure to multiply at university, and he felt his poverty was reflected by his lack of decent, or matching, socks. The first thing he wrote in his pad was "How can I become a millionaire?" Twenty minutes later, the Million Dollar Homepage idea was born. It was selling pixels, the dots which make up a computer screen, as advertising space, costing a dollar per dot. The minimum purchase was $100 for a 10x10 pixel square to hold the buyer's logo or design. Clicking on that space takes readers to the buyer's website. With $999,000 banked so far, Alex recalls his thought process at the time. He says: "I wrote the title to spark the creativity and then wrote down the attributes the idea needed. It had to be simple to set up and understand. "It had to have a name to capture the imagination and be something that could be set up quickly with no physical delivery required. "I wrote down some keywords and then the idea came out 20 minutes later - selling pixels. So I snapped up the domain name that very night." 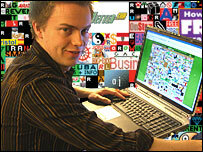 Alex spent £50 on buying the domain name (milliondollarhomepage.com) and a basic web-hosting package. He designed the site himself but it began as a blank page. His friends and family paid the first $1,000 dollars, which he spent on a press release. That small publicity gave his site more traffic, which in turn persuaded more advertisers to have faith. An iconic image of internet art? "It snowballed," he says. "As I made money, more people talked about it and the more people talked about it, the more money I made." Four months and 2,000 customers later, including The Times and Orange, and the million dollars is almost surpassed. Two million different people have accessed the site, which has a wry blog and FAQs, in the last seven days. "I've been blown away. These have been the most exciting and hectic months of my life. Things are quite surreal at the moment and because it's been so busy it hasn't really sunk in. "It seems like Monopoly money. Previously I'd associated money with working at Tesco getting paid £5 an hour." His first business venture was when, aged eight, he drew comics and sold them at school. He had no intention of going to university because he wanted to try out some of his ideas. But after three years of odd jobs such as stacking shelves in Tesco, and setting up some websites, like humanbeatbox.com, which led to a cameo part in EastEnders, he decided on a degree. Yet before he'd even started his business management course at Nottingham University, he was on his way to earning a million dollars. Employing a press officer has helped generate publicity and sales in the US, where he spent a week doing interviews, and he thinks his own honesty in setting out his million-dollar plan chimes more with the Americans than with British reserve. His last 1,000 pixels will be sold on Wednesday on eBay, in a clever and lucrative twist to the story. At the time of writing, bidding was an astonishing $152,100, which reflects how much demand has outstripped available space. "I didn't want to create another page because I wanted to keep the space exclusive, that's one of the attractions for buyers. It will be quite lucrative for me, but it's the best option because I didn't want to turn away people who wanted to be part of it and the increased cost they'll pay will hopefully be value for money because of all the interest in the last 1,000 pixels." Far from being part of a gimmick, Alex says his advertisers have been more than happy with their investment. And Chris Magras, the president of US website promotion company Engineseeker.com, confirms that his $6,400 was cash well spent. "Our leads and sales have increased by 30% and the traffic has not stopped," he says. "The buy was perfect for a one time source of continued advertising and has paid for itself in its first month." Alex believes his success - and there are hundreds of other similar sites trailing in his wake - is down to two things: the power of word of mouth and the story of a student making a million, which enchanted the media. Does Alex Tew deserve his million dollars? Others eager to learn from him should have faith in their creative mind, take calculated and affordable risks, and treat "failure" in a positive way, as a learning process, he says. "It's to do with having faith in your subconscious mind. The million-dollar target came first then I worked backwards, then I relied on some part of my brain to provide the answer. "There's something to be said for having faith in your own creative ability because I think it's instinctive, although it's either suppressed or encouraged from an early age." When the last square is sold, the homepage mosaic will be complete, a kind of visual metaphor for the internet. One writer has even quipped that it could be a potential Turner Prize nominee. "One of my original aims was to create a piece of internet art that reflects what's current on the internet and what's possible, because I've made a million from that image. I want to create an internet capsule to keep for years." Typically, he already has an enterprising avenue in his head - selling the image as poster prints. Staying one step ahead of the pack seems instinctive to him and Alex is good natured, although dismissive, about the other sites which have sprung up since. And his other ideas - strictly under wraps - could be coming to fruition. "We're still in the internet's early days. Commerce will be streamlined and based around this global network. There are things that don't exist now and will exist in the future. Who will be the next Friends Reunited and the next Google?" With money to back him, he's in a good position, although he's got plenty to ponder - job offers and investment opportunities from around the world, and whether to finish his degree. In the meantime, student life goes on as normal with no extra expectation for Alex to get the drinks in. He's already splashed out on a mini and a trip to Tokyo for his parents as a "thank-you" and his mother, a registrar, will become his part-time PA.
And new socks? His favourites cost £3 and their design is, appropriately, pixellated. I think it's a stupid idea; just the kind of place for stupid people to pay stupid money for a stupid service. It made him a lot of money? Give it to charity... Now there's a news story worth publishing! I don't know much about website designing but after taking a look at this site, I think it is a good piece of art and this guy deserves his money. If I had a company, I would advertise with him. Good luck Alex you have given advertising a new look. I fail to see why someone would advertise on his site when they could setup numerous sites of there own with larger more comprehensive adverts for less money. It's the kind of spam style site that makes me hit the 'X' button as quickly as possible. Of course he deserves the money. He' hasn't put anyone else out of business, or taken advantage of third world wages to get it, Well Done. Personally I think the web page itself is an awful mess and it's difficult to see anything on there that really interests me, considering a lot of the sites are advertising for 'Dating, Poker etc - none of which interests me at all. I prefer to use the main Search engines to find what I am looking for. The first bird gets the worm. Well done but the 2nd/3rd ideas (money making) will be a lot harder.. Brilliant idea. If only my 21 year old daughter could come up with something equally as brilliant! I think he deserves every penny of that money! Not only is it very clever advertising, but its certainly verging on an art form. Goes to prove just how open the internet is to a good idea and perhaps now the saying should be 'The Internet is the mother of all invention'! Well done mate! Glad to see someone doing the business. Great socks too!! It was a great idea. All sales people know you sell the sizzle, not the steak. This guy created a lot of sizzle that made advertising on his page desirable, and sellable. Good for him!! It's so nice to hear of a student making money instead of squandering it in a bar somewhere. When I was at Uni, I certainly could have done with even a (nicely sized!) fraction of a million dollars, and I knew of someone who had to quit because they were so much in debt. I wish him all the luck in the world - and hope that he does decide to complete his degree, as it's such an incredible achievement.